Embark on an odyssey of reflection, self-discovery, and creative inspiration with The Wild Unknown Journal, a beautifully illustrated and hand-lettered guided journal from Kim Krans, the visionary artist and author behind the bestselling The Wild Unknown Tarot and The Wild Unknown Animal Spirit. Welcome to The Wild Unknown Journal. The labyrinth of creativity awaits you …. Your journey begins with a dynamic, interactive introduction that invites you into this contemplative space and explains how to use the journal and all the possibilities it offers. More than 125 exquisite pages of powerful prompts follow—combined with emotionally evocative watercolor imagery and elegant black-and-white line art—igniting an intimate and transformative experience for writers, artists, daydreamers, or anyone seeking creative magic. 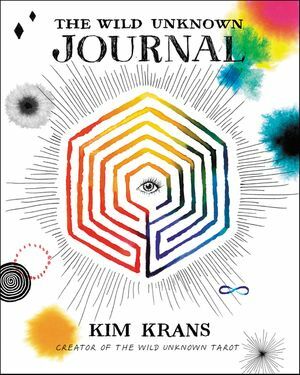 Liberating and meditative, this stunning journal offers us a deeper connection to our present moment and inner most selves—freeing us to write, draw, color, collage, and create. Tap into the untamed power of the wild unknown as you discover how to unleash the imaginative, the intuitive, and the inspired within.